I would like to give my 2 cents on a burr that I JUST started using to shape the concaved surfaced of my custom fly fishing nets. I was looking for a faster/easier way than using scrapers, rasps, and sanders. 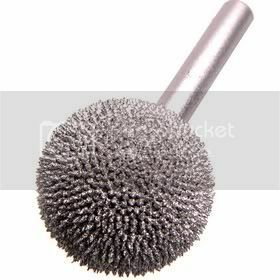 It’s a Carbide Abrasive 1” Sphere Burr by King Arthur. This Sphere Burr fit flex shafts, mini die grinders and air grinders and has a 1/4” shank x 1” diameter. It’s also available in European 6mm shanks. I use it on the lowest setting of my Rotozip which is 15K rpm. This speeds up my handle shaping time by at least 15-20 minutes each! This was EXACTLY what I was hoping for. The diameter was even perfect. All Hail King Arthur! LOL! I was really skeptical that it would load up burn, but I was very impressed with its ability to remove wood and FAST! It has not loaded up on me yet and I have roughed out two handles with it: Claro walnut & Maple Burl. Here is a link to the part. At $24.99 + 8 something for shipping, this was a heckuva deal for me. Greg, this sounds like it filled the bill perfectly for you. And it has pretty much already paid for itself in the time it saves you. Thanks for the review. My wife wants me to make some spoons and such for gifts, and this should take care of the hollowing out part. I use those bits all the time. They are excellent.. If they get gummed up just burn it off with your blow torch. It does not hurt them at all..
That’s a good tip, David. Thanks for sharing it. After each bit I use to carve gunstocks gets gummed up, I just soak a bunch of them in oven cleaner and after 30 minutes or so, just wash them off with boiling water so the heat will dry them in seconds. After a coat of gun cleaning liquid, they are oiled for protection from rust, but the Hoppies gun cleaning fluid I use won’t make them slip in the router chuck.